- 8 PIECE QUEEN BEDDING SET: [Comforter, Sheets, 2 Pillow cases, 2 Shams,Bedskirt] - Valance / Drape Set: [(NOTE THAT THE CURTAINS DO NOT HAVE LOGOS. 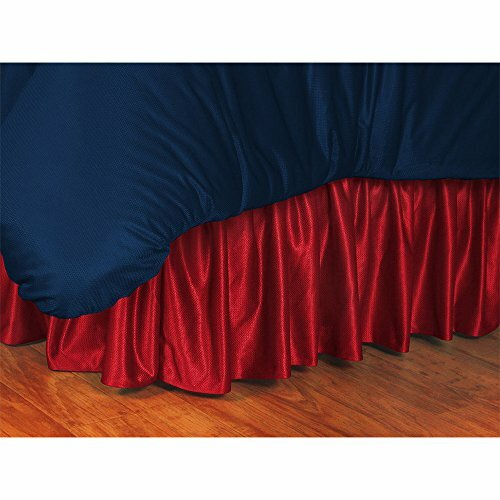 ONLY VALANCES HAVE LOGOS)CONTENTS OF VALANCE/DRAPE SET: Two rod pocket curtain panels totally measuring 82 inch wide (horizontal) x 84 inch long (vertical); Two matching tie-backs; One valance with screen-printed logo 88 inches wide (horizontal) x 14 inches long (vertical).] Wallhanging: [The 100% Polyester Jersey is 29 ½" x 45"L - lined in poly/cotton - and includes wooden dowels and string for hanging. Machine washable.] Please note: This sale is only for the items described. Other items pictured are for illustration only. Made of 100% durable polyester. Printed with your choice of collegiate team logo. Choose from the available size option. Take your team support to the next level. Machine washable. - 4 PIECE QUEEN BEDDING SET: [Comforter, 2 Shams, 1 Bedskirt] - SHOWER CURTAIN Please note: This sale is only for the items described. Other items pictured are for illustration only. - 4 PIECE QUEEN BEDDING SET: [Comforter, 2 Shams, 1 Bedskirt] - One Matching Window Valance: [Valance with screen-printed logo 88 inches wide (horizontal) x 14 inches long (vertical).] Drapes are not included and are pictured for illustration only. Please note: This sale is only for the items described. Other items pictured are for illustration only. - 4 PIECE QUEEN BEDDING SET: [1 Comforter, 2 Shams, 1 Bedskirt] - 1 Valance / Drape Set: [(NOTE THAT THE CURTAINS DO NOT HAVE LOGOS. ONLY VALANCES HAVE LOGOS)CONTENTS OF VALANCE/DRAPE SET: Two rod pocket curtain panels totally measuring 82 inch wide (horizontal) x 63 inch long (vertical); Two matching tie-backs; One valance with screen-printed logo 88 inches wide (horizontal) x 14 inches long (vertical).] Please note: This sale is only for the items described. Other items pictured are for illustration only. 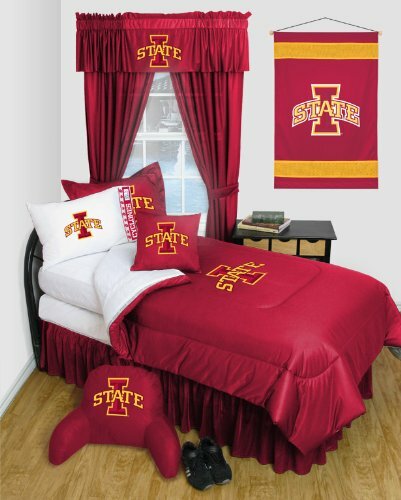 - 4 PIECE QUEEN BEDDING SET: [Comforter, 2 Shams, 1 Bedskirt] Please note: This sale is only for the items described. Other items pictured are for illustration only. 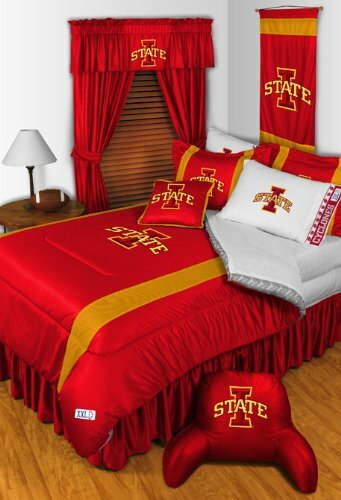 - 4 PIECE QUEEN BEDDING SET & Bonus 4 Pc Towel Set: [1 Comforter, 2 Shams, 1 Bedskirt, 2 Bath Towels, 2 Hand Towels] - Please note: This sale is only for the items described. Other items pictured are for illustration only. - 6 PIECE QUEEN BEDDING SET: [Comforter, 2 Pillowcases, 2 Shams, 1 Bedskirt] Please note: This sale is only for the items described. Other items pictured are for illustration only. 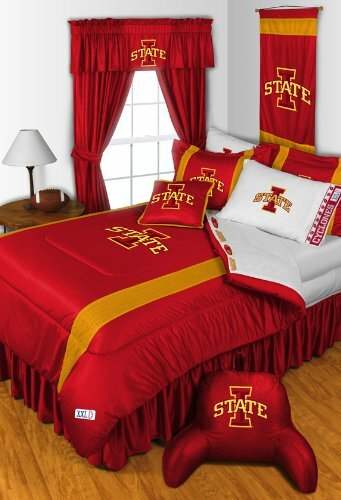 Looking for more Iowa State Queen Bedskirt similar ideas? Try to explore these searches: 1992 1993 World Series, Burton Full Zip Sweatshirt, and Brown Suede Guitar Strap.